Melbourne's National Gallery of Victoria (NGV) has a flock of fascinating shows and installations on this season, from radical fashion to architecture, design and art. We share five of the best current must-sees below. For future diary dates, make plans to catch US photography exhibition 'William Eggleston Portraits' (17 March-18 June 2017) and major draw 'The House of Dior: Seventy Years of Haute Couture' (27 August-7 November 2017). Radical Dutch fashion duo Viktor&Rolf's surreal creations get their first Australian airing in 'Viktor&Rolf: Fashion Artists'. Exploring their love affair with wearable art, the exhibition includes more than 40 haute couture and ready-to-wear looks, many verging on the sculptural with 3D details. Dollphobics look away, as there are also 21 handmade Belgian dolls sporting ensembles. A video gallery of runway footage brings the pair's performance-art-inspired catwalk shows to life. Children will love separate interactive installation 'Atelier: Viktor&Rolf For Kids'. Known for his environmentally conscious, locally sensitive designs, Glenn Murcutt turned 80 recently, but this hugely influential Australian architect is still making waves. NGV exhibition 'Glenn Murcutt: Architecture of Faith' delves into one of his most inspiring recent projects, the new Australian Islamic Centre at Newport, Melbourne, created with practice Elevli Plus. Defining a new language for contemporary Australian Islam, the building respects traditional mosque architecture while bravely pushing the boundaries in terms of geometry, colour and materials. We told you pink was trending! This playful pink reimagining of a suburban car wash has taken over the NGV's Grollo Equiset Garden. The 2016 NGV Architecture Commission, it was designed by local M@Studio Architects and modelled on the dimensions of a real car wash. Made of lightweight steel with cricket-netting walls and a translucent polycarbonate roof, it sports five bays of hot pink AstroTurf with rubberised humps and road markings. Illuminated at night with a sparkly 'car wash' sign, it hosts talks, live music and events, with two lanes diffusing cooling mist. 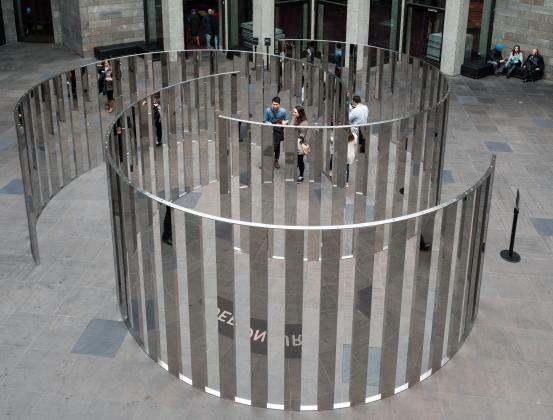 A disorientating maze of reflective stainless steel, 'Semicircular Space' by Danish-born, Berlin-based contemporary artist Jeppe Hein is a striking, immersive installation in NGV International's central Federation Court. Shaped like a sinuous nautilus, it's proving an Instagram favourite. Major Australian art exhibition 'John Olsen: The You Beaut Country' celebrates one of the country's greatest living artists, aged 88, known for his wonderful ways with colour, fluid form and grand scale. Featuring Olsen's 'You beauty country' series begun in the 1960s and inspired by Australian landscape and nature, as well as more recent prints, paintings and watercolours (including some representing Lake Eyre's return from drought), it's pure palette pleasure.